NOTE: This documentation has been updated for version 2.x. If you are using 1.x template overrides and need help porting them to 2.x, please read our migration guide. This template has the bulk of the checkout page template. It's everything between the header area (essentially the title area) and the footer (copyrights). The header template renders the site name / logo. The footer template renders the copyright information, as well as any custom text provided in settings. Static assets such as images are places in this folder. This folder contains the TypeScript and Sass files needed to build the template assets. Template files should never directly modified because they are replaced with each plugin update. Instead you can over ride them in your theme. 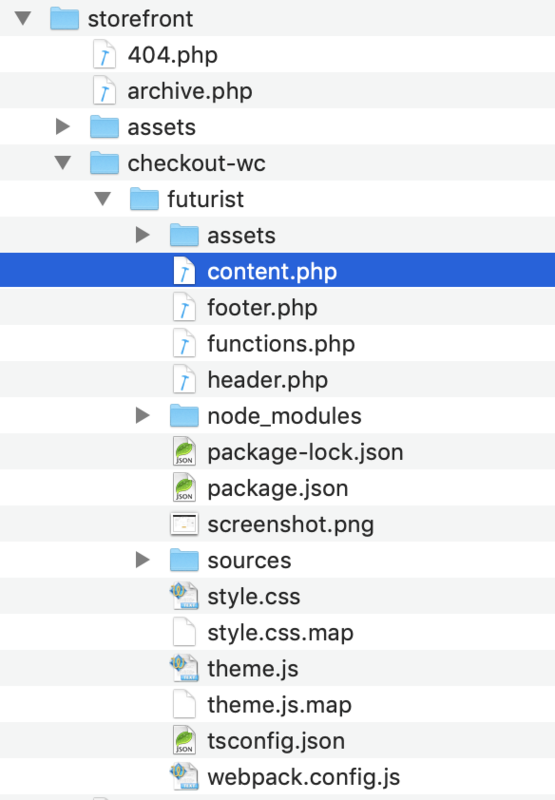 To do so, create a directory named 'checkout-wc' in your theme or child theme and copy any of the relevant templates into this directory. If you want to make changes to the TypeScript or Sass files in sources/, you will need to run a few commands in terminal. We are assuming you have some basic knowledge of npm and webpack. Open terminal and cd into the template directory.